Having grown up as a military brat, I don't have a history of place, but places are my history. When I started using impressions of manhole covers in my ceramic work, I recognized these covers as the 'where' in our lives. These utility covers reveal the wear and tear of time and people. Some are simple; others are complex. The design is deep and allows for excellent texture in a finished piece. I've been pursuing my love of ceramics for over 20 years. 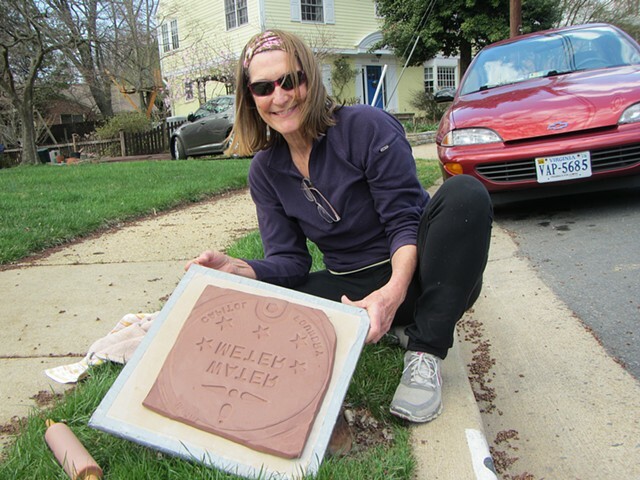 A 2015 work sabbatical gave me time to dig into my ceramic work; now I carve out time while enjoying my career as a Northern Virginia Realtor. I make impressions directly on the utility cover to create a master mold that is used to create trays, vases, and tiles. My finished pieces allow for familiarity, conversation and functional use. I am a studio member at Lee Arts Center in Arlington, Virginia. My clay body is stoneware and I fire to cone 5/6 in an electric kiln.